Race to the scene where a worker calls for help! Zoom in on your motorcycle to fight the flames. If you can't reach the fire, call in the Fire Response Unit helicopter and help the firefighters put out the container fire with a tank full of water. It’s another job well done! Price is 23% below the initial Lego retail price, a € 6.88 discount! This comes down to 8.99 cent per brick. The Fire Response Unit (60108) Lego set is available from the sites below. However, they do not offer delivery to your selected region. The Fire Response Unit (60108) Lego set is no longer directly available from the sites below. However, 3rd party partners of these sites might still have the set available. 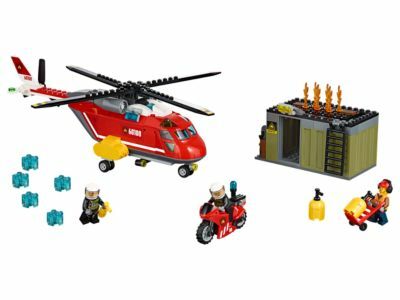 Alternate description Help the Fire Response Unit beat the blaze on the container roof before it reaches the gas canisters, featuring a helicopter, motorcycle and 3 minifigures. Includes 3 minifigures: a pilot, firefighter and a worker. Features a helicopter with rotating blades and cargo doors that open, and a motorcycle with space for a fire extinguisher. Fly the helicopter over the container to release the water elements and turn the container roof element, putting out the fire. Accessory elements include a welder, 2 gas canisters, trolley, fire extinguisher, wrench, 5 water bricks and a saw. Helicopter measures over 3” (10cm) high, 12” (33cm) long and3” (8cm) wide. Motorcycle measures over 1” (4cm) high, 2” (7cm) long and under 1” (2cm) wide. Container with flames down measures over 2” (6cm) high, 4” (12cm) wide and 2” (6cm) deep.